It’s Saint Patricks’s Day on this particular Monday, although most of the celebrations were held over the weekend. Except for Fort Lauderdale, which inexplicably celebrated LAST weekend. It was quite a feat to get to the Arts Garage in Delray Beach on Saturday, the day Atlantic Avenue was blocked off for the town’s St Paddy’s Day Festival and parade. After circling with the masses of cars also looking for parking, we were fortunate to find some enterprising homeowner who opened their front yard for parking at $20 bucks a pop. We’re pretty sure he can re-sod and still have something left from his take for the day. Fortunately, parking was easy for our sojourn to Miracle Mile, where we caught the excellent production of Spamalot at Actors’ Playhouse. The Kravis Center opens its Noel Coward Festival on Tuesday, according to the Sun-Sentinel and The Palm Beach Daily News. …audiences kept responding to Coward’s material. Revues such as “Temple of Dreams — Theatre Songs From the West End to Broadway” in 2011, “He Loves, She Loves” in 2012, and “Broadway Babies” in 2013 all relied on Coward’s compositions. South Florida Gay News interviews Michael McKeever about his latest play, Clark Gable Slept Here. 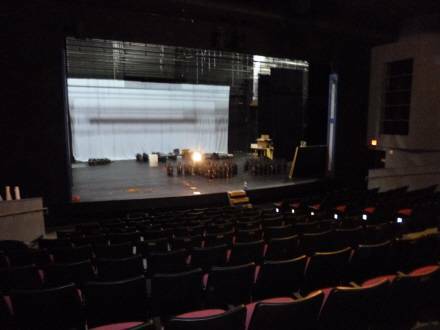 The Zoetic Stage production opens at the Adrienne Arsht Center for the Performing Arts this week. “It’s a very, very dark comedy,” promises McKeever, winner of multiple regional Carbonell Awards for his plays, who based the story on the real life experiences of a friend who lives in Los Angeles. McKeever’s friend was propositioned in a gym sauna by one of “those actors” who frequently find their names published in the tabloids. You know you’re a legitimate Broadway star when your caricature can be found on the walls of Sardi’s. Theatre Mania reports that South Florida’s Rachel Bay Jones has joined that elite cadre. Over on BroadwayWorld, there’s an excerpt of an interview with the creator of the TV shows HANNIBAL and PUSHING DAISIES where he discusses the merits of another South Florida actor, Raul Esparza. A few years ago, Jim Brocchu moved to South Florida, and then decided to tinker with a one man show about Zero Mostel over at the Broward Stage Door Theatre. Zero Hour then toured for the better part of year before going to New York, where it extended several times. Last year, Brocchu played the Stage Door again, this time with Character Man. He’s taken it to New York, and The New York Times gives it a thumbs up. Congrats, Jim! …Jim Brochu had a hit with his one-man show, Zero Hour, …in Character Man, a blend of cabaret, theater and scrapbook, he pays homage to a much larger lineup of actors and produces a solidly satisfying evening… Walks down memory lane are rarely so inclusive and entertaining. If the recent past is any indication, there is no guarantee that those who loved the little movie will run to see the living spectacle. Nevertheless, everyone is seemingly getting into this film-to-stage act... This adds only more fuel to the accusation that originality and risk on Broadway have virtually disappeared. The removal of the old growth trees on the E.W.F. Stirrup property was only one in a series of chess moves made virtually simultaneously as the Coconut Grove Playhouse deal begins to unfold. It seems someone is writing a soap opera. We’re curious to see where he’s going with this.